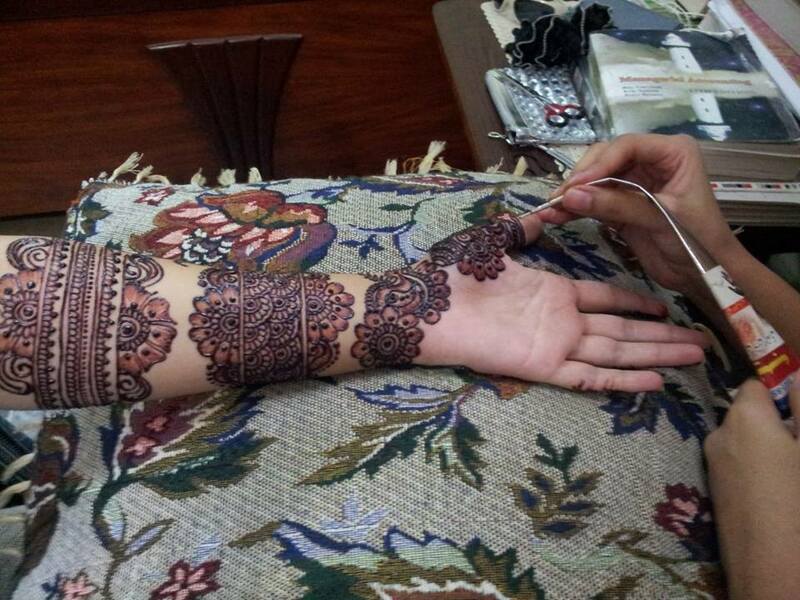 Meet one of the best bridal mehndi artists – Laraib Shafique. 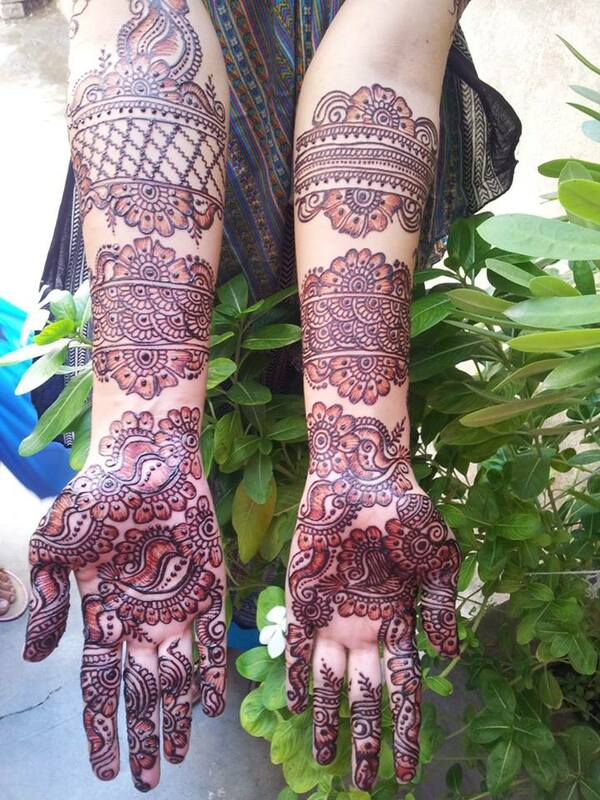 Hope you enjoy Zuri’s interview with her, and the gorgeous mehndi designs she creates! Last time we introduced a very talented mehndi artist to you from the US. This time I have a pleasure of introducing Laraib to you. She hails from Punjab, Pakistan. I was floored by her designs and talent, and wanted to interview her immediately. This is her interview. Note that Laraib answered some of her questions in Urdu, and I have tried to do a translation myself (so please forgive me if the translation is not very good). I have also, for the first time, tried to transcribe Laraib’s interview in Hindi (so again, please forgive me if it is not quite proper Hindi, as it was very difficult to transcribe it on this blog). I am 23 years old, from Punjab and have been applying/designing mehndi since 10 years and it is god gifted. मेरा नाम लरैब शफीक है. मैं पंजाब से हूँ. मेने पिछले 9 सालों से मेहंदी का अभ्यास किया गया है. मेरी प्रतिभा भगवान से एक उपहार है. 2. What are your top favourite mehndi designs? My favourite designs are Arabic mehndi which comprises mainly of flowers and thick fillings. मुख्य रूप से फूल और मोटी लाइनों मेरा पसंदीदा डिजाइन है, जो अरबी मेहंदी डिजाइन की मुख्य विशेषता है. 3. What is the most memorable experience you have had while doing mehndi designs – something that has stayed close to your heart and is remembered very fondly? My most memorable time was when I applied mehndi to 17 girls in one day. मैंने एक दिन में 17 लड़कियों को मेहंदी लगायी – वह मेरा सबसे ख़ूबसूरत और यादगार समय था. 4. What are your most important tips to take care of the mehndi after applied? The best way to make the mehndi color dark is by waiting for it to dry entirely and then apply Vicks all over. Another method is by breaking a few ‘laung’ pieces and placing them on a heated ‘tava’ and taking the steam on your hands for 2-3 minutes. My face book page is Laraib’s Mehndi & Make up Art. 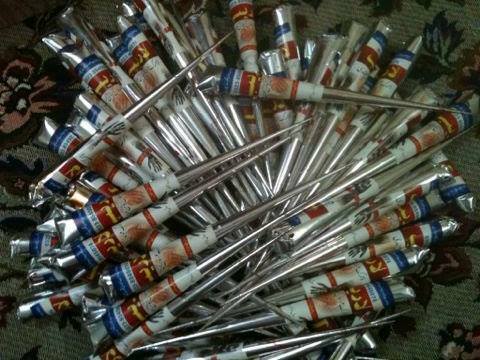 I have my own mehndi cone brand (Laraib’s dark maroon cone mehndi) and sell it all over Pakistan. 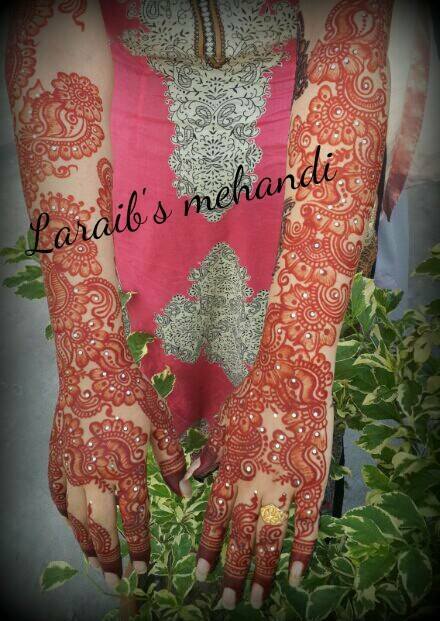 Enjoy mehndi designs by Laraib. (Published with permission of Laraib Shafique. Please don’t use these designs without permission from the original source).